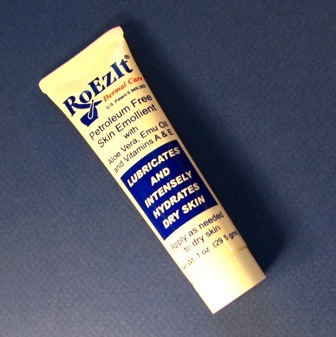 OXYGEN USERS - Apply RoEzIt® Dermal Care before beginning oxygen therapy and at intervals as needed during treatment to lubricate the facial area, as well as over the ear where friction from tubing may cause discomfort. DRY SKIN - The problem with dry skin associated with oxygen delivery by means of plastic cannula has been well documented by caregivers at every level for decades. It is a wonderful nose lubricant due to my 24/7 use of oxygen. this is an item I can't do without when I'm using oxygen. It keeps my nose lubricated and I don't hve nose bleeds when I use it. The RoEzIt came promptly and well boxed. This product was exactly what I wanted. Thank you so much. I use it regularly when I use the oxygen for my migraine headaches. I like your companie's price as compared to the competition. I feel that you put out a fair product. Thanks again.